Jesse Iwuji, a Surface Warfare Officer in the US Navy, races the No. 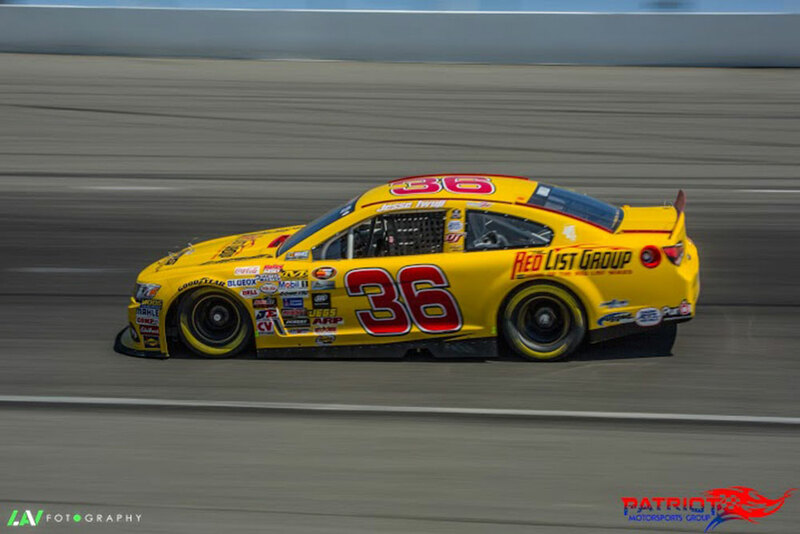 36 List Group Chevrolet in the NASCAR K&N Pro Series West. Jesse Iwuji is a relative newcomer to NASCAR. He has only been driving competitively in late models and with the K&N Pro Series for the past two years. He only has five K&N Pro Series West races under his belt. But he has aspirations of racing in the NASCAR Sprint Cup Series and one day in the Coca-Cola 600 at Charlotte Motor Speedway. That day may still come. But for now, the 28-year-old driver from Texas is playing a big role in one of NASCAR’s biggest races. 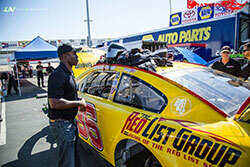 Jesse Iwuji has started five NASCAR K&N Pro Series West races. 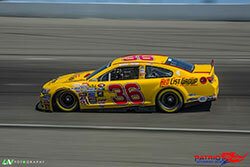 He was 14th in the race at Kern County Raceway Park in April. Iwuji, a lieutenant in the United States Navy, will host a military family at the NASCAR Sprint Cup Series Coca-Cola 600, dubbed the 600 Miles of Remembrance, at Charlotte Motor Speedway over Memorial Day weekend. He will take the family on tours at the race track and be a NASCAR ambassador through the practices, qualifying, and races. Iwuji is part of NASCAR’s An American Salute program. During the NASCAR races at Charlotte Motor Speedway, teams, drivers, fans and track partners will honor members of the US Armed Forces, veterans and their families. It is a two-part program to pay special tribute to fallen service members. The second part of the program will take place during the NASCAR races at Daytona International Speedway over the Fourth of July weekend. Iwuji took a unique path to NASCAR. He attended the United States Naval Academy in Annapolis, Md., before starting his racing career. It wasn’t until he graduated from the Naval Academy that he started pursuing a career as a professional race car driver. He was a safety on the football team and ran on the track and field team at Annapolis. When he graduated, he served as a Surface Warfare Officer with two tours in the Middle East. On his leave from tours, he started racing dragsters. He bought a Dodge Challenger for drag racing when he lived in Maryland, but that didn’t last long. He moved to San Diego for Mine Countermeasures training shortly thereafter, before being deployed to Bahrain with the Mine Countermeasures Tour Exultant in 2010. When he returned, he decided to test his driving skills at the Mojave Mile. He drove a car 200 mph on the desert track in California, becoming one of a select few to accomplish the feat. He moved to Monterey, Calif., and was assigned to the Naval Postgraduate School in Student Services. There he joined a NASCAR team and began working toward becoming a professional race car driver. Jesse Iwuji will host a military family at the NASCAR Sprint Cup Series Coca-Cola 600 at Charlotte Motor Speedway over Memorial Day weekend. 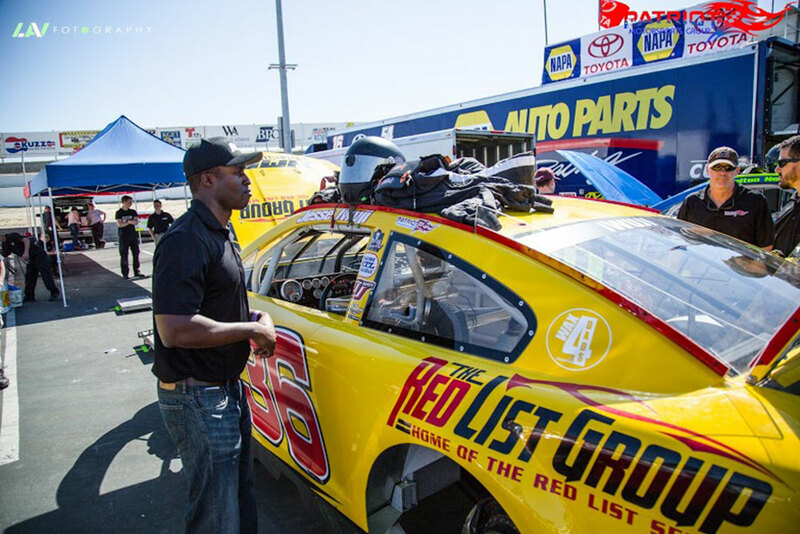 Iwuji is a lieutenant in the US Navy and has been racing in the NASCAR K&N Pro Series West for the past two years. In addition to racing in the K&N Pro Series West, Iwuji is racing late models at Meridian Speedway near Boise, Idaho. He is racing Outlaws, Street Stocks, and Modifieds on dirt tracks. He said his goal this year is to gain as much experience as he can in as many different types of race cars that he can. He has raced at Irwindale Speedway in California in the NASCAR Whelen All American Series. He earned his license to drive in the NASCAR K&N Pro Series in 2015. He made his debut in the K&N Pro Series West at Evergreen Speedway in Washington that same year. He has started five NASCAR K&N Pro Series West races and is coming off his best career finish, 10th place at the Orange Show Speedway, in San Bernardino, Calif. In the K&N Pro Series West race at Tucson Speedway in Arizona on May 7, driving the No. 36 Red List Group Chevrolet, owned by Kevin McCarty, he was 15th. His previous best finish came in the K&N Pro Series West race at Kern County Raceway Park, in April, where he came in 14th. Jesse Iwuji, a driver in the K&N Pro Series West, will be part of NASCAR’s American Salute program at Charlotte Motor Speedway over Memorial Day weekend. 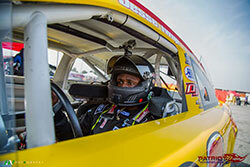 Iwuji said he knows he has a lot to learn about racing in the NASCAR K&N Pro Series. The drivers he is racing against have much more experience. They are more familiar with the tracks and some have been racing since they were 6 years old. Iwuji sets personal goals every race. He is not so interested in winning races as he is in improving every time he is on the race track. 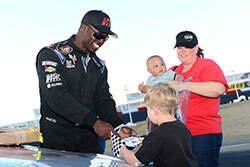 Iwuji added that he is more concerned with learning the new race tracks on the K&N Pro Series West schedule. He is also focusing on how to prepare his car for each track and what he can learn when he returns to each track.